Etsy certainly has some innovative handmade items for sale. One that has particularly caught my attention is the package of Guerilla Gardening Seed Bombs by Etsy seller Lucky Monkey. 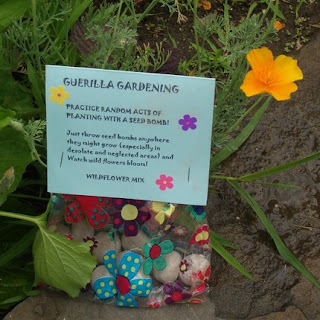 If you are unimpressed with some of the greenery (or lack thereof) in your neighborhood, then take the advice of Lucky Monkey and practice random acts of gardening with her Guerilla Gardening Seed Bombs! These "bombs" are wildflower seeds rolled into small balls of clay. Throw them in the neglected (and flower friendly) location and watch them bloom! What a great idea! Love these ! Thanks !